What is a workplace injury with days away, restrictions, or transfer (DART)? If an employee is injured at work and he/she misses days of work, has to restrict his/her work activity, or temporarily transfer to a different job, it is a DART injury. Why do we measure the number of workplace injuries? This safety metric helps us determine how many workplace injuries and illness required employees to miss work, perform restricted work activities, or transfer to another job within a calendar year. By tracking where and how these injuries happen, we can take steps to prevent future injuries and keep employees safe at work. 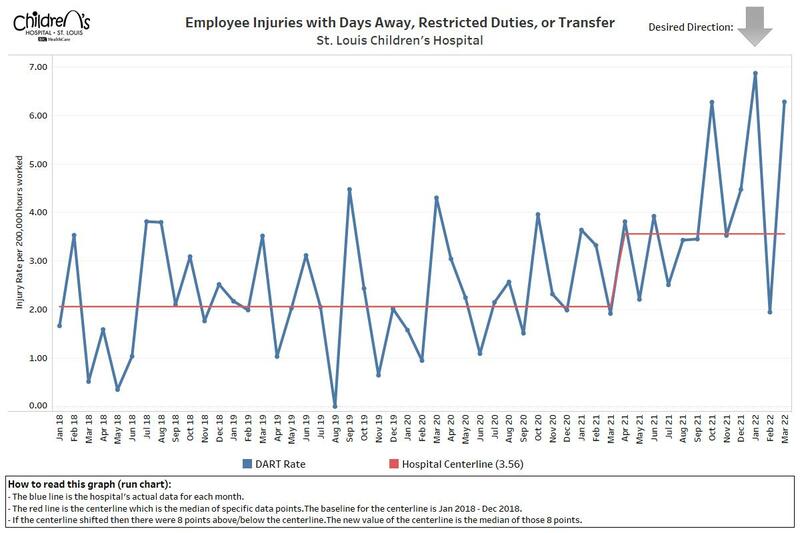 The number of injuries with days away, restriction or days of job transfers per 200,000 labor hours. Developed 2017 SLCH Safety Goals and provided them to every employee. Published monthly SLCH Regulatory and Safety Newsletter to inform staff about hospital industry regulatory and safety issues. Implemented SLCH Safety Cross to discuss the previous day’s employee injuries or incidents during unit and leadership huddles. Provide bi-weekly hospital and department education based on injury and incident trends in the hospital. Developed action plans to reduce department-specific injuries and incidents. Developed safety training presentations for staff based on leading hazards in the workplace. Provide monthly and quarterly department injury reports to department directors and managers. EHS Department reviews department injury reports with department directors and managers to ensure safety matrices are being met. What can employees do to help prevent workplace injury or illness? Discuss employee safety concerns during departmental meetings. Educate and train other employees on specific safety hazards in the workplace. Provide the proper personal protective equipment (PPE) and ensure that it is being used. Ensure good housekeeping standards are being met to prevent unintentional workplace injuries or incidents. Use situation awareness when performing job tasks.